I met Jeanne Steinhilber on the crochet cruise. She is so easy to get to know and fun to crochet with. She is part of The Crochet Crowd. She has been designing patterns in the Hugs & Kisses line. This cell phone holder works up really fast. It is so handy! I have found many times to use it. My hands are free and I don’t have to carry a purse. You can find the free pattern here. I like to make at least one new decoration for every holiday. Stars and Stripes Patriotic Top Hat is a pattern from Desert Diamond Crochet. The pattern is on ravelry here. The pattern on ravelry has 4 sizes. The pattern I have only has 2. The pattern is quick and easy to follow. I decided to not crochet the stars as I had some buttons that I wanted to use. The Mountie came from being a pattern tester. The designer is Victoria Stewart and her business is Once Upon a Hook Crochet. The pattern is available here on ravelry. She has well-written instructions that make him fun to make. For some reason my Mountie is very worried. Facial expressions are fun to play with. It did take time to put him together. There is a lot of sewing and changing colors but it is worth it when you are done. This is the first pattern I have made of hers and I look forward to making more. I know it is summer but I love working with Bernat Blanket yarn. I finished this afghan made from Pumpkin Spice. The pattern is free from by Jess Coppom. It is called The Snow Drifter Chunky blanket. You can find it here on the Make & Do Crew webiste. She gives you guidance on how to make various sizes of blankets. I made one a little bigger than the pattern. I started with ch 112. I ended up using 4 skeins and continued in length until I used up 4 skeins. It turned out to be a nice size. The pattern is easy to follow and works up fast. We received a pattern book on the cruise. All of the patterns will be free on The Crochet Crowd website in a month or so. I was able to be in a group of helpers so I received the patterns before the cruise. I made almost all of them before the cruise. I really enjoyed helping other crocheters out during the cruise. 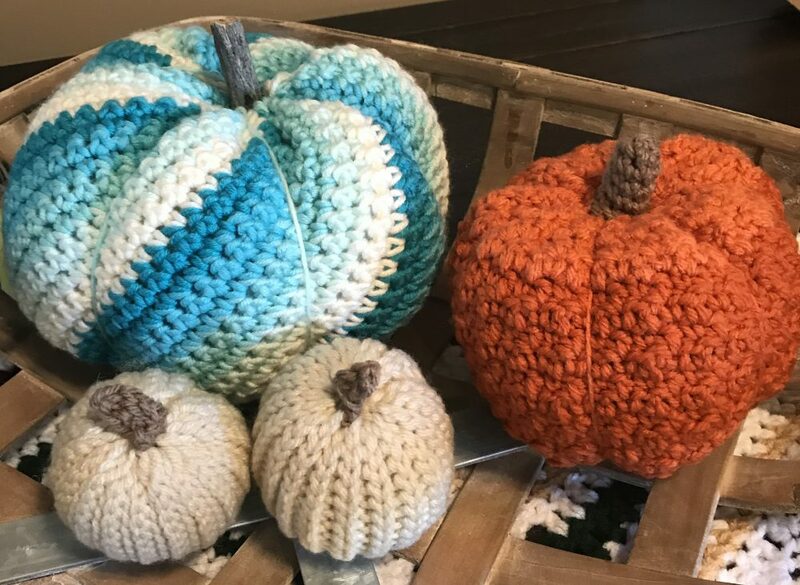 Some were so happy to try new techniques and realize they could do things they never thought they would be able to crochet. Diva Dan created the Alaskan Fjord Cowl. I used Bernat Blanket yarn in light green and gray in my sample. It is so soft! This is a fun pattern. It uses a version of a link crochet stitch. You end up working thicker rows across. The pattern is available here. Jeanne created the Hugs & Kisses Headwarmer. She has quite a few patterns in the Hugs & Kisses line. The headband works up fast and is very cute to wear, I used a teal color in worsted weight yarn. The pattern is available here. Donna designed the Tidewater Shawl. The pattern calls for Patons Grace. I didn’t have that so I used MicroSpun yarn in silver. It is the same weight as Patons Grace but ended up being a little thicker. I recommend using the Patons Grace yarn. On the cruise I saw some shawls made out of Grace and they look more delicate. The pattern is not out yet. Mikey designed the Forget Me Knot Afghan. I just got one square done. I have been enjoying patterns with texture and this afghan delivers that. There are so many color combinations you could do. You can find the pattern here. Jeanne also designed a Hugs & Kisses Tote Bag. I used a variegated yarn in the recommended brand of Bernat Maker Dec. It is hard to see the stitch definition when using the variegated yarn. As you can see in the picture, I haven’t quite finished the handles. I want to add beads to the end of the straps and then I will tie off the long white strands. This pattern hasn’t posted yet. There was a pattern for an Outdoor Basket using new yarn – Bernat Maker Outdoor. I didn’t have that for my sample so I used Bernat Home Dec. As you can see, Jet tries to fit in anything. I received some of the outdoor yarn on the cruise and I can’t wait to use it. I didn’t see this pattern available yet. The pattern book includes a knit dishcloth (I don’t know how to knit.) Megan had a few crocheters learning to knit. My brain and hands don’t work well with two utensils. Donna also had graphs related to the Alaskan cruise that you could make into a scarf or an afghan. I didn’t have time to make any of these. Last summer I signed up for a crochet cruise. I was so excited to find this trip. Every once in awhile I would google crochet trips and there isn’t much out there. The Crochet Crowd does these cruises a few times a year. I signed up to go to Alaska. It is hard to commit to a trip like this a year in advance but I am so glad I did. The Crochet Crowd has a website dedicated to the cruises. You can find it here. I had so much fun. The scenery in Alaska is breathtaking. I did some fun excursions at each stop. BUT back to the crocheting. I have only done one crochet cruise. This is how this one was laid out. Friday is the day we left. In the afternoon we met and got our goody bags. JoAnn Fabrics sponsors the cruise. We do pay an activity fee that covers the cost of the room and some of the items we get. You can see from the above pictures we got a JoAnn bag (that zipped!) full of items and a red bag that had the crochet cruise logo for the Alaska trip on it – also filled! Below is a picture of what I came home with. I traded the Caron Simply Soft skeins for more Bernat Home Dec and Outdoor Home Dec. I also won a yarn umbrella that I am trying to figure out how to set up. On Friday evening, we exchanged our squares. We had homework before arriving on the ship. We were to make 4 c2c squares. I hadn’t done these before so I was glad to have a reason to try them. I really like them and they work up fast. I did two with striping yarn and two graphs. The graphs look nice when finished but are a pain to make with all the yarn attached. I did find I needed to count after each row to make sure I didn’t get off. Caron One Pound was provided as community yarn. I used gray and light blue. I bordered each square and then joined them and added more of a border. JoAnn provided fleece for us to back our afghans. I had never done this before and really like the technique. Mikey from The Crochet Crowd has some good video tutorials on YouTube for this. By the end of the cruise we had close to 200 blankets completed for charity. The one I did has my one square (the black/gray one) and the rest is from the community.